Just say no to nuggets. We’ve got boneless, skinless No Name® Premium Chicken Breasts coated in a flavorful mix of Dijon mustard, garlic, onion and a layer of Parmesan peppercorns. 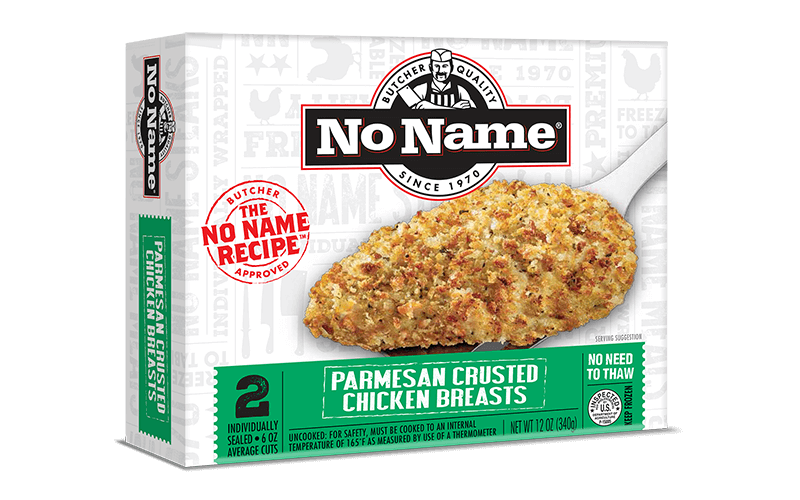 Click here for No Name® Parmesan Crusted Chicken Breast recipes. INGREDIENTS: CHICKEN BREAST, CANOLA OIL, DIJON MUSTARD (WATER, VINEGAR, MUSTARD SEED, SALT, WHITE WINE, FRUIT PECTIN, CITRIC ACID, TARTARIC ACID, SUGAR, SPICE), NATURAL BUTTER FLAVOR (WHEY SOLIDS, ENZYME-MODIFIED BUTTER, MALTODEXTRIN, SALT, DEHYDRATED BUTTER, GUAR GUM, ANNATTO AND TURMERIC [FOR COLOR]), DIJON MUSTARD POWDER (DEHYDRATED DIJON MUSTARD [DISTILLED VINEGAR, MUSTARD SEED, SALT, WHITE WINE, CITRIC ACID, TARTARIC ACID, SPICES], MALTODEXTRIN, MODIFIED FOOD STARCH, SILICON DIOXIDE, NATURAL FLAVOR), SALT, BLEACHED WHEAT FLOUR, SALT, SUGAR, DEHYDRATED PARSLEY, DEXTROSE, YEAST, PASTEURIZED PART-SKIM MILK, CHEESE CULTURES, SALT, ENZYMES. Place in oven and bake according to times listed below or until internal temperature of the product reaches 165˚F. Pre-heat grill to medium heat. Remove chicken from plastic wrap. Make a foil pouch. Lightly spray foil with vegetable spray. Place chicken on the foil. Fold the foil into a closed packet. Place foil packet directly on grill. Heat for 10-12 minutes. Open the top of the packet and continue cook for 5-6 minutes or until product reaches an internal temperature of 165˚F. Since grill brands vary, cooking times may need to be adjusted. Always defrost product in the refrigerator. Do not place cooked product on the plate that held the raw product. Turn product with tongs or a spatula. Piercing product with a fork results in loss of flavorful juices.